One more round for the males and mares pacing at Yonkers Raceway this weekend, then the George Morton Levy Memorial and Blue Chip Matchmaker pacing series hold their finals The ‘Levy’ and Matchmaker finales are set for Saturday night, Apr. 26. The purses are $567,000 (Levy) and $371,400 (Matchmaker). These are the two richest races to date this season in North America and are accompanied Apr. 26 by their respective consolations (Levy for $100,000, Matchmaker for $75,000). At the Meadowlands on Saturday, two series’ finals are included in the program. The Artistic Vision for three-years-old-and-up filly-and-mare pacers goes for $55,800 and the Whata Baron for three-years-old-and-up horse and gelding pacers has a purse of $63,000. Plus, again this Friday we engage in the Meadowlands Early Pick 4, with its last three legs a Pick 3 on its own. Pocono presents a Bobby Weiss Series late-closer worth $30,000 on April 19’s program. We have something to say about some value in that contest. Until Nov. 18, playing Pick 4s at Hoosier Park through your TwinSpires account offers specials. Ten times point-earning advantages take place on every Tuesday program and Pick-4 bonus bets are plentiful. The bonus feature includes every Pick 4 on every Hoosier program. We will be adding Hoosier to our horses to watch (H2W) list and suggesting horses during the week on Twitter @FrankCotolo and @TwinSpires. Click here for details. We have added a few horses to watch (H2W), on our exclusive list for TwinSpires harness blog. Use these suggested contenders that are proving productie across-the-board wagers and serve as profitable members of exotics. Yonkers Raceway presents the penultimate divisions of the Levy on Saturday, April 19 and all we can do is depend on outsiders to make this series a profitable affair. Certainly betting winners of many divisions cannot shout for joy on their win-mutuel returns. Hopefully we have helped with strong place and exacta additions to those short-priced favorites. The trio of divisions tonight are also short for bargain shoppers, with two Burkes making it a five-horse betting mile. We are coming back to Sapphire City in this split, since he has shown some stuff in the series and may be able to handle Clear Vision, Burke’s best of his pair. Along with Apprentice Hanover, first or second, these two could increase the payout of an exacta and put a decent price to the win column with “City” atop. Burke sends three in division deux and we go back to Texican N for an upset. He hasn’t rallied in the series but hasn’t surrendered, either. Driver Brian Sears sticks with him and he could present some value among the five betting entities if he scuttles through late and gets a share of the series lucrative rewards. No one knows what to say against Foiled Again, who leads the last division’s field with an impeccable 2014 record, all in this series. Two other strong contenders are Burke-trained, so what is left but the outrageous—that competent foe Malak Uswaad N shocks the field with Sears and trainer Peter Tritton taking two on the night (Texican N is Tritton’s student). Whatever you do, use Tritton’s charges in both exotics as well as taking a shot for an upset win. Friday, April 18, the divisions in the fifth round of the Matchmaker series take one more shot to get a berth in the final or to a consolation next week. Division one goes with seven on board. Yagonnakissmeornot gets post 7 and Ideal In Vegas post 3. Those two will probably be the favorites over four lightly raced non-winners and another with a single win in a dozen starts this season. Coming in from the north is Scandalous Hanover for trainer Casie Coleman. This mare has only two starts and was second in both. If she was revving up for this, she can take it, perhaps as third choice. The second of the two divisions is loaded with talent and almost impossible to establish an honest line. The crowd, however, may split their votes between Somwherovrarainbow and the mighty Anndrovette. The best scenario to hope for is that swarming speed will make waste of those two and Summertime Lea (who has to leave from post 8 to make noise). There is a chance for Coleman to sweep the duo of divisions if Monkey On My Wheel can stay mid-pack while the flaming fractions ensue and then cut through the smoke and beat Shelliscape, who should also be closing (if not, she will burn out too). The $55,800 Artistic Vision Final at the Meadowlands on April 19 brings together six participants in the series; two are a coupled Ron Burke entry and one of them is the prolific American In Paris, who has yet to lose in six starts this season, all at the Meadowlands. While the Burke brigade is barreling through the Levy series across the river, his duo here, which includes Art Ideal, will take the majority of win money from the public and receive all of the accolades from the public handicappers. If you wish to key exotics with the Burke duo, don’t expect a windfall. If you want to try to beat “Paris,” we call to your attention Hobe Sound as the upset candidate. Her two attempts in this series were both thwarted by Paris but she races well in both—even her seventh-place finish last week had a positive side, with a 10-length close as the field roared to get Paris. 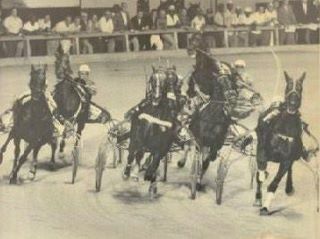 Before that she was only 6-1 in the series and was fourth and before that she was productive at Yonkers, though a bad trip ruined a win for her in the Petticoat Final. John Campbell picks up the drive (at press time) and can be trusted to give her the best ride she can get. All that is left in the next series finale Saturday at the Meadowlands are four-year-old male pacers. They go hunting for the best of a $63,000 purse in the Whata Baron Final. Making up for a tough sophomore season, Wake Up Peter has been strong against this group, winning both of his “Baron” legs. Captive Audience has accomplished the same with his divisions and these two will be the obvious public choices. All we can see in the way of an upset is Burkentine Hanover. From post 10 he will be dismissed, as he was last week. But he was fired up and soaring, gaining while wide and coming very close to “Peter” at the wire, finishing third at 8-1. He should be far more than 8-1 in this and that is all the more reason to rebel against the top two. The Meadowlands Early Pick 4 (April 18, $30,000 guaranteed pool, 15-percent take), tails off into the Pick 3 with its second leg. Here are some suggested contenders, hopefully other than the obvious choices for both multi-race exotics; as well, they are sound across-the-board competitors. Nine three-and-up pacing fellas, with two also eligible, go on April 19, in Pocono’s Bobby Weiss Series Final, worth $30,000. The Burke brigade is present with two, uncoupled, but they are in deep, with many series competitors in the mix. We are looking for All Gold to be one of the overlooked contenders. His most recent series leg was a tough 8-hole grind and before that, at 9-2, he finished just behind one of the probable public choices here, A Stitch In Time (leaving from post 9 in this battle). In a race where so many entries can be argued, we’ll take All Gold.